After a long running financial crisis came to a head in June 2012, Scottish giants Rangers were punished by being placed in the bottom tier of Scottish football. It was the first time they had ever been outside of the top tier, as the 54 times champions were forced to suffer the indignity of being in the same division as Clyde and East Stirlingshire. “And when Alexander saw the breadth of his domain, he wept, for there were no more worlds to conquer”. The above is a well-known quote relating to Alexander the Great, who became distraught that he had won his final victory, and was nothing else to achieve. In the last three seasons, Celtic have won the title by 20 points, 16 points and 29 points respectively. This year they are facing a refreshing challenge from Aberdeen and lie in second place, but they are just two points behind with two games in hand – it is hard to see anything else than another green and white procession come the end of the season. Of course, winning the title every season does not sound like a bad thing. But when you are 1/500 with bookmakers before the season begins to claim the title, is it really an achievement? To put it into context with other sports, it’s like winning the Formula One world title, but everyone else is riding a bicycle, or becoming UFC World Champion after defeating a four-year-old. Sure you did it, but there was nobody who could realistically challenge you. I love watching football at all different levels, and in the last couple of years I have watched games in the Austrian Third Division, the Dutch amateur league and even the regional league for Belgrade. However, when Rangers were relegated I completely lost interest in the Scottish top flight, and have not watched a single game since apart from the Edinburgh derby. With Hearts and Hibs now also relegated from the Scottish Premiership, there isn’t a single game I can bring myself to care about. Without the madness, controversy and chaos that surrounds Rangers vs. Celtic, there is very little reason for supporters outside of Scotland to care about Scottish football. This does not just impact TV viewing figures, but there is no doubt that players in the past have joined either Rangers or Celtic just so they can play in the Old Firm derby. Without it on the calendar, the league gets poorer, and the quality of the players on both sides declines. This leads me nicely to my next point, the role of Rangers as the villain within Scottish football. Because if you are Scottish and don’t love Rangers, you almost certainly hate them. Just think back to the glee last season that surrounded the struggles of Manchester United, and the continuing delight this has provided to the world as they continue to underperform this season. Now, if the Glazers decided that enough was enough and decided to put the club out of existence, there is no doubt that Liverpool, Leeds and half of Manchester would have a celebratory hangover for at least a month. But what then? The whole point of a rivalry is constantly striving to get one over your opposition, whether it’s by finishing above them in the league, winning the derby or knocking them out of the cup. If Rangers went out of existence once and for all, it’s all over. No more derby goals to celebrate, no more friends, coworkers or people down the pub to mock after a win, and no more weeks of excitement leading up to the latest meeting of the sides. Your club goes on, but one of the main reasons it has to exist does not. This is not just true for the top sides like Celtic and Aberdeen who would be competing with Rangers for silverware, but every other side as well. As a supporter of a Scottish club, can you honestly say you would get the same level of enjoyment from beating Motherwell 1 – 0 as you would from the same result against Rangers? Rangers have been extraordinarily successful for an incredibly long time, and this given them the prime position as the bad guys of Scottish football, and everyone loves to get one over the bad guy. Imagine a James Bond film where Bond has a quiet day in the office, updating a spreadsheet and doing some filing. That’s Scottish football without Rangers. Scotland very nearly qualified for Euro 2008, with a number of memorable results and excellent victories during their qualification campaign. During the most recent international campaign, Scotland were the first UEFA team to be eliminated from the World Cup qualification process. With many of the Scottish squad traditionally playing for Rangers, the rapid decline of the club has caused problems for the national team also, with key players plying their trade in the lower regions of Scottish football, and therefore not being truly tested at club level, hurting their chances to make the step up to international level. Then you come to the performances of Scottish clubs in European competition. 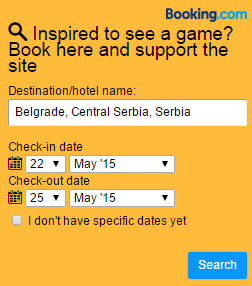 Save for Celtic making the last 16 of the Champions League in 12/13, it has been pretty bleak viewing since then. St Johnstone being knocked out by Minsk, Malmo beating Hibs 9 – 0, Dynamo Moscow seeing off Dundee United 7 – 2 and Motherwell losing to Icelandic minnows Stjarnan are just some examples of the disasters which have befallen Scottish clubs in Europe, with the UEFA coefficient rapidly declining by the year. Now I am not suggesting that Rangers would be picking up victories over Real Madrid and Barcelona (indeed, at the moment they are so bad I have my doubts they would beat Rochdale and Barry Town), but they would regularly make the group stages of the Champions League, including an away draw with Manchester United as recently as 2010, and only losing the return game thanks to a Wayne Rooney penalty in the 88th minute. It will take them a couple of years to even be good enough to qualify for Europe, but once they do make it back, it is almost certain that they will put up a better show in continental competition, and help Scottish football to make a bigger impact in Europe. Since 1996, there have been 18 seasons of top flight football contested in Greece. Of these 18 seasons, Olympiacos have been the champions on 16 occasions, and they are top of the table once more this season. Deadly rivals Panathinaikos have managed to take the title for themselves on two occasions in this time, but it is essentially a one horse race. This lack of competition caused supporters to lose interest, and clubs spend too much in an attempt to compete, leading to the disastrous recent history of one of the countries’ most famous clubs, AEK Athens. After being relegated for the first time in their history at the climax of the 12/13 season, the club chose to enter the lowest tier of Greek football possible, and become an amateur club. After a glorious and immensely successful history, AEK are now reduced to playing away games in stadiums which have a capacity of 350. Since Rangers were relegated, we have already seen financial problems lead to the relegation of two large traditional clubs in Hearts and Hibernian, and the problem is only likely to get worse for the remaining clubs if there is nobody available to offer a challenge to Celtic. 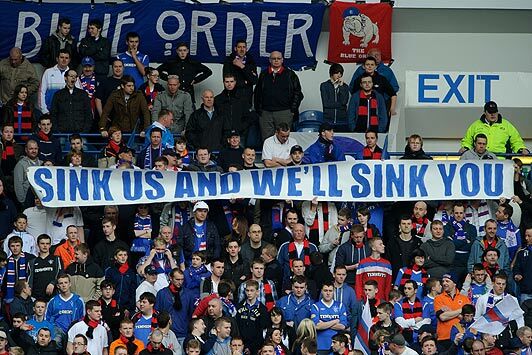 If Rangers die, I expect them to take a number of other clubs down with them. Let me make it clear. Rangers is one of the most shambolically run clubs in the entire history of football, and is arguably the worst run club British club ever. They do not deserve to get away with the tax irregularities, and is right to punish them. However, if the club dies, so does any chance of the businesses they owe money being repaid. No football club, no debt, no money for the creditors. 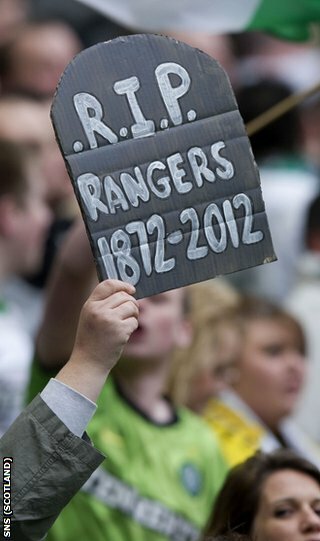 If you are angry at the money Rangers owe, the only way it is going to be paid is if they still exist. Lastly, it is not the supporters’ fault that these things happened at their club, and they have angrily demonstrated against the board since the revelations came to light. The Rangers Supporters Trust is currently running the Buy Rangers campaign, a move which would put the club in the hands of the fans, far away from greedy businessmen out to make money for themselves at the expense of the integrity of the club. There is also the Rangers First group and many others who are looking to make a positive change and save the club from destruction. 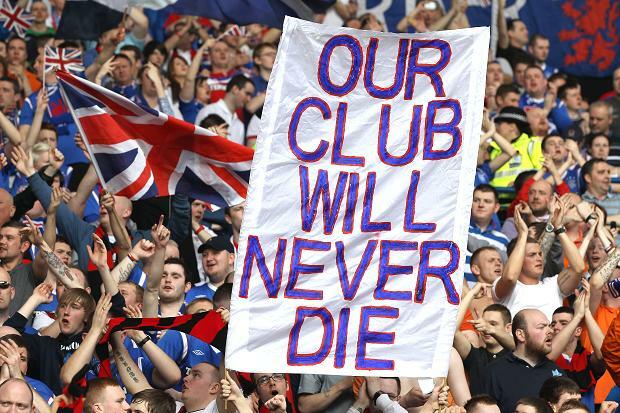 Because for all the ‘dead club’, ‘sevco’ and ‘zombie’ comments which are thrown their way, it is still the same Rangers Football Club which was formed in March 1872, and the same Rangers Football Club which has gone on to lift hundreds of trophies since. After 142 years of Rangers, it is still unclear if there will be a Rangers in 142 days. But does the club deserve to go on to recapture past glories? It’s absolutely fine to hate Rangers, in fact if you support any other club, that’s what you’re supposed to do. However, in my opinion their resurrection is not just something the supporters deserve, but something which is essential if Scottish football is to remain remotely relevant in ten years time. Posted on January 20, 2015, in General. Bookmark the permalink. 8 Comments. A rangers fan calling Celtic fans Neo-Nazis? Am I missing something here? Very surprised at this entire blog to be honest. Normally I enjoy Bens blogs about his travels and match experiences however, there are so many inaccuracies in Bens comments it’s difficult to decide at which point to start highlighting them. Usually the use of the word “suffer” insinuates you should feel empathy and some sympathy for whoever the subject is but anyone who knows of the endless years of cheating, the feelings of every other club in the Scottish league (except Kilmarnock) , the long long list of creditors (including face painters and Mr Custard) who recieved not a penny from the club now known as The Rangers International Football Club and the ongoing process with Their Majesty’s Revenues & Customs knows better. Obviously Ben either does have an allegiance to the newest club in Scotland or he has “done a Murray” and been duped into believing the pantomime story. That isn’t an attack on Ben by the way and I would like to think it is for the latter reason. As an outsider it would be easy to believe this unbelievable story was exactly that…unbelievable. There could have been a conspiracy to bring down the establishment club however, in every sentence of every paragraph in the above article there is mistake after mistake. If it is an article written on behalf of a neutral fan of football I would expect them to at least get their facts right (and it wouldn’t take to much looking into). I can’t say how disappointed I was when reading this, not only because I am a Celtic / Feijenoord fan (yes Ben, I too enjoy the Green Hare) but because it will make me doubt much of what Ben writes about in the future. Unlike Ben I won’t be attending the first game between the 2 clubs. I refuse to get involved in a club and media driven circus. I attended these games when they really were our biggest rivals. Those that know the truth know. Those that don’t dont matter. Cheating Glasgow City Council and Scotland out of money that could have gone to schools , parks , youth clubs through cheap land that was sold on the cheap to us and then sold for massive profits when the commonwealth games and subsequent regeneration came with it came along. We then have this victim mentality that has taken hold within large swathes of the support , which manifests itself in Fans Against Criminalisation . The aforementioned organisation was formed in response to the football bill which most fans in Scotland quite rightfully oppose , however FAC went off tangent and claimed that the bill was brought in purely to victimise us poor oppressed Celtic fans which as we know is utter codswallop as it was brought in to to target all fans regardless of who they support , just ask all the Rangers,Hibs,Hearts,Partick Thistle,Motherwell,Ayr,Ross County,Auchinleck Talbot fans who have either been arrested or experienced ridiculous levels of policing at their respective games . Then we have FAC claiming that only their songs are getting criminalised completely overlooking the fact that these songs would fall foul of the terrorism act . Lastly we have another huge chunk of the support fraternising with known Neo Nazi groups from the continent just ask the Bad Blue Boys of Dinamo Zagreb who were cuddling up to our supporters in Glasgow and Zagreb during our two encounters in the Europa League . So please Celtic fans stop trying to be holier than thou becuase we aren’t and such antics will only come back and bite us in the bottom again and again . Failing miserably here at kidding on you are a Celtic fan….I can’t even say “good effort”. Very surprised at this.The club in question bankrupted themselves and others followed “to keep up with The Joneses” which has led to the current situation. My team,The Accies overcame the odds to win an enthralling second leg at Easter Road and have went from strength to strength.The ethos of ourselves and others is to bring young Scottish players through and plenty clubs doing this now. Celtic will most likely still win the League,but the top 5 have provided a challenge and all played good football. They are where they are and they were lucky to be back in as they never met the criteria for admission to the bottom division and were shoehorned in.The Rangers fans-in the main-have enjoyed their move up the Leagues and any promotion this season has to be on merit… .otherwise what’s the point. Playing in a deep Scottish winter and pricing are more prevalent issues up here. * The financial issues at Hearts were NOT, I repeat NOT, a direct result of Rangers. These were Hearts own issues of the previous owners making and would have happened irrespective of Rangers plight. Being a Hearts fan, and one who believes Scottish football is a good product poorly managed, I find it an insult to imply that “we need Rangers” to survive. Clearly you’ve not seen this seasons Scottish Championship table. * Hibs were not relegated because of financial problems, Hibs were relegated due to an appalling second half of the season, and an excellent performance by Hamilton Accies in the second leg of their play-off. * It’s true, Scottish clubs in Europe have always under performed (out with Celtic and Rangers by in large) and last season was particularly bad. It’s also true, Scotland as a national side have under performed during Craig Levien’s and George Burley’s tenure. It is however picking up and we are playing attractive football under Gordon Strachan. To say that Scotland are poor without Rangers in the top flight sounds like retro-fitting an answer to a problem. I feel that Ben has let us down on this occasion and really not done his homework into life in the Scottish game. The argument he gives shows he has only skimmed the surface of the issues the game in Scotland has, and while I agree with part of his conclusion (Scottish football is in real danger of becoming a backwater irrelevance), I do not agree with how he has arrived at this. Scottish football needs strong, open minded and transparent leadership. For too long has it’s governance been self-serving and geared towards keeping Celtic and Rangers happy, and every other club served up as cannon-fodder for the big two. Anyone speaking out against this is usually gunned down with overtures of “know your place!” from a media with an agenda to appeal, again, to the Old Firm following. The game is dying in the hands of the “blazer & brogue brigade” who cannot even find a sponsor for our top flight. Yet hope remains, teams like Hearts and Hibs are on the brink of fan ownership. Aberdeen have been well led and are a credit to the game challenging Celtic. While I don’t think Scottish clubs will be able to compete on anything close to the same level as the top English counterparts, a well run and inclusive game in Scotland would benefit us more than this archaic belief that we should continue to pander to Celtic and Rangers to ensure our games survival.